Please read the Court Etiquette article under the "Information" tab on our website. When you arrive to play, please help set up a net standard before starting play. 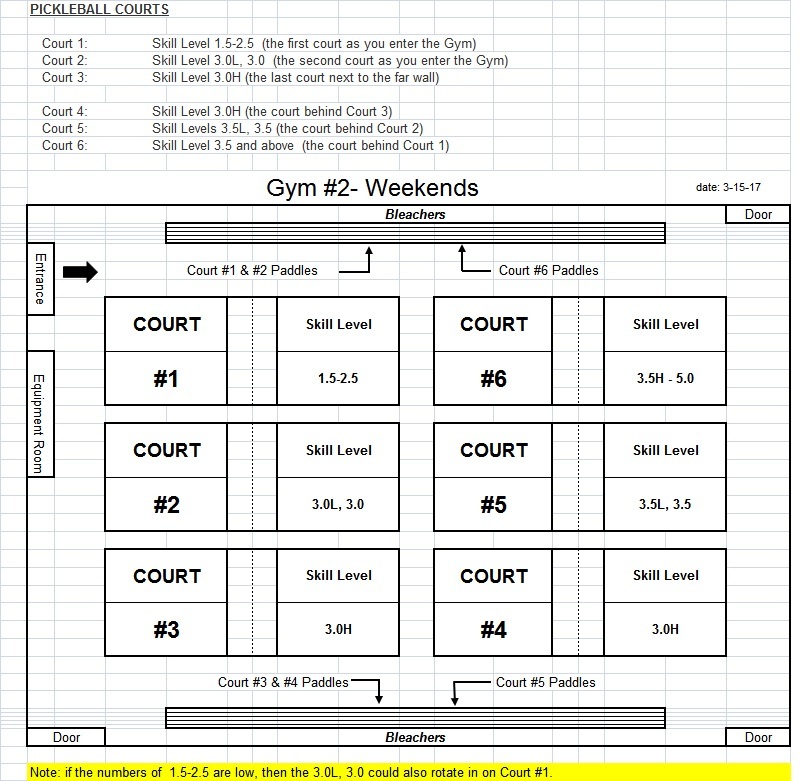 Before you leave, please help take down a net standard unless there is someone waiting to play on your court. Please do no assume that the court will be used laster in the day. All courts use the paddle line up system to determine who goes on court next when there are more players than courts available. When partners want to practice for upcoming tournaments, they may play together if their opponents agree. No player should continue to play on the same court during drop-in play for more than 2 consecutive games (unless no one is waiting to play). If there are many players waiting to get on a court, please consider playing games to 9 points instead of the regular 11, as this will speed up play and allow more players access to a court. This should be done by agreement of the players affected. Shout “Pickle” if a ball from your court goes into another court. To prevent injury and to avoid hindrance to play on another court, do not go on to the other court to retrieve the ball. Also, please do not simply hit a ball back that rolls onto your court from another court; pick it up and keep it or return it to a player on the court it came from, when that player knows you are returning it. This website (www.aikenpickleball.com) contains our playing schedule calendar, handouts, news, andlLinks to all things related to pickleball. Go to the “Contact Us” tab on the home page to send an email with any questions or comments you have about the Odell Weeks pickleball program or to have your email address added to our List Serve. Positive and constructive comments are always welcome! Please continue to exhibit the tenets of good sportsmanship, courtesy and friendliness for which Aiken Pickledillys are so well known! All newcomers and visitors are welcome to our program! 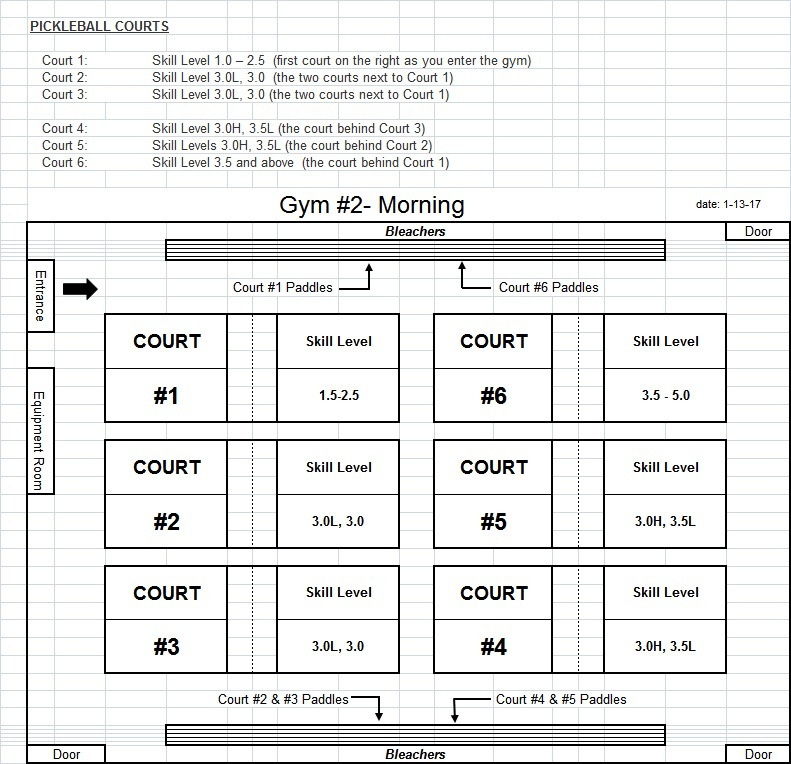 If there is no one waiting for your court in Gym 2 when you finish playing, please take down the net and net standard, put ithem in the bag, and take them to the equipment room in Gym 2. Even if there is play scheduled for later in the day, please do not assume that your court will be used. If there is any doubt, take the net down. The staff at the front desk do not know our schedule, so they will not be able to tell you whether the court will be used later. The days and times for each format session are listed on our website under the "Calendar" tab. All skill levels mix together. There is one paddle queue feeding into all six courts. This is co-mingling time to welcome and play with newcomers or play at another skill level to advance your game. We encourage players to partner up in the most balanced way possible, ensuring the best game for all players. Players may play at their skill level determined by the Rating Committee as posted on our website. The aschematics below indicate skill level court assignments. During these play sessions, all players may arrange for a group of four or more players to play together. Reservations are required and can be made by using Sign Up Genius. Instructions and a Link to Sign Up Genius are on our website for this purpose. Only paid-up members of Odell Weeks will be entitled to make court reservations. Players who wish to request a rating for court designation play at Odell Weeks should contact Ron Nelson for 3.5H and below ratings, and either Tony Quick or Mo Garcia for 4.0 and up ratings. To see the skills expected at a given level, click here. To review the pickleball rules, click here. The USAPA UTPR ratings are not yet stable/reliable. These ratings will be reviewed in a few months and the decision will be made as to whether to start using them. Two possibilities as to when these will be used are (1) when they start to be used for skill designations in sanctioned tournaments, and (2) as of January 1, 2019. The rating process for 4.0+ players will remain essentially the same with either Tony or Mo available to perform a requested rating. Changes include the addition of the rules test to the rating process and a standardization of a list of specific skills that form an integral part of the rating process. Tony and Mo may collaborate as needed.